There is no arguing that smartphones are amazing pieces of technology but how many of us have crossed the line from using the useful to abusing our smart phones? 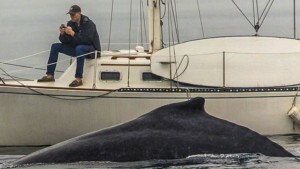 Photographer Eric Smith captured a man off the coast of Redondo Beach, California, so engrossed in his phone he is apparently missing a humpback whale casually lounged just feet from his boat. The image was posted to Instagram on Feb. 2, 2015. Smart phones are now an established, pervasive part of humanity. You probably have a pattern of checking your phone compulsively, throughout the day. Do you ever wonder if you’ve become an addict? What make something addictive? Can media be addictive even though it isn’t a drug? Let’s look at the facts. According to Pew Research, as of January 2014 90% of American adults have some kind of device they check regularly. Back in 2012, 67% of cell owners find themselves regularly checking their phone for messages, alerts, or calls even when no alerts or notifications compel them. More stats on cell phone use from Pew Research here. People are nuts for their phones, no doubt. Greenfield argued that any media tech could be potentially addictive,calling them”psychoactive.”, an adjective usually reserved for prescription, shamanic and recreational drugs. Greenfield claims that smart phones and other interactive media modify the user’s mood and trigger positive feelings. Anything you enjoy instigates a dopamine reaction the brain that can become a sought after sensation and cause compulsive, over-indulgent behavior. The unprecedented speed with which the smartphone took hold on humanity can be distressing. Some people feel downright paranoid about it(but maybe not enough to give up their phones~!). Back in 2011, Amber Case argued that reliance on smartphone technology is one of a short list of developments that technically makes us all cyborgs(see video below). Probably the best illustration of the frustrating, problematic but undeniable appeal of smartphone hogging our attention is the 2013 short film and smash-hit youtube video, I Forgot My Phone. The short movie starred actress Charlene deGuzman – who also wrote and directed it. The main character wanders, slightly unsettled through various social situations wherein everyone around her is so captivated by their phones they seem oblivious of what’s happening in the physical world. I wonder how many of the 40+ million views it got involved people watching on their phones? From the moment they wake up until the moment they go to bed, and throughout that time the devices provide an almost continuous stream of messages and alerts as well as easy access to a myriad of compelling information sources. By design, it’s an environment of almost constant interruptions and distractions. The smartphone, more than any other gadget, steals from us the opportunity to maintain our attention, to engage in contemplation and reflection, or even to be alone with our thoughts. Nicholas Carr, author of The Shallows: What the Internet is Doing to Our Brains. So, chances are you are an addict. What can you do about it? It’s going to take self-awareness and discipline to use a smart phone in a responsible way. In the book Sleeping with Your Smartphone by Leslie Perlow the author recommends taking Predictable Time Off(PTO). In a small-scale experiments claims to have proven an increase in efficiency, better collaboration, heightened job satisfaction, and better work-life balance. Anecdotal evidence has shown that effort put into reduced or more structured smartphone use noticeably improved mood and concentration. You can try reducing your dependency on handheld devices by trying to go 15 minutes without checking your phone even if there are alerts or messages pending. After a few days try adding another fifteen minutes. Every few days you can add more time until you can comfortably go over an hour without looking at your device. Does it work? For now, there is not enough research on this subject to tell. Until a more scientific approach to studying the issue happens, you’re going to have to follow your gut. Mine is telling me we are all addicted already. Cosmoso.net will be publishing more data as it is made available. Until then… put the phone down for a second, will ya?